In the first of a seven-part series on 3rd Battalion, 5th Marines, NPR correspondent Tom Bowman revisits the seven-month deployment with an interview with Lt. Col. Jason Morris, who commanded the battalion during the deployment from September 2010 to March 2011. The 3/5 had 25 Marines and corpsmen killed in action, the highest casualty rate for any single unit in Afghanistan in 10 years of war. “It was just over a year ago that Morris took nearly 1,000 Marines to a place in Helmand called Sangin. It was a haven for Taliban fighters and drug traffickers, a place where the British lost more than 100 troops in four years. But the British failed to push out and pursue the enemy, and the Taliban continued to control much of the area. It was Morris’ job to take it back,” Bowman writes on the NPR web site. Marines with 3rd Battalion, 7th Marines were the first leathernecks up in Sangin following the British; 3/5 took over for them and 1st Battalion, 5th Marines just came home from its own seven-month deployment there. More than 40 Marines and sailors have been killed in action there during that time, both from units assigned to the area and specialty detachments and individuals assigned to those units. Now, 3/7 is back in the fight in Sangin. You can read and listen to the NPR story on 3/5 here. Being an Uncle of a 1/5 marine..I can say he might be the first to send some kudos to the 3/5 who paved the way for seven months of 1/5 success…just saying..
NPR has continued to report on the war in Afghanistan, and I appreciate it. Kudos to the 3/5, the 1/5, the 3/7. And don’t forget the 1/6, still in Sangin. Many thanks to Battle Rattle for clear reporting. Thank you for acknowledging the fact that 3/7 was the first USMC unit in Sangin as a Battalion. Our contribution is often overlooked or even inaccurately reported due to the amount of coverage that 3/5 received after they relieved us and sustained such a high amount of casualties. We were in Sangin from June to October of 2010 and saw extremely heavy fighting on a daily basis. We worked along side the Royal Marines for the first three months, and then by ourselves until 3/5 came into country. Despite the amount of contact that we had (we set a Division record for amount of air/artillery/mortar delivered ordinance dropped in one day), we only suffered three KIA while in Sangin. Much of the Bn felt very disrespected after we returned to CONUS and found that most people and media outlets didn’t even know that we had been in Sangin. It was even more disheartening when the Commandant talked to us in 29 Palms about a “little place called Sangin” where 3/5 was whipping it on. It was very apparent that his aides hadn’t informed him that we had just returned from there and had a very real first hand experience. And now we are back. It is a very strange experience to return to Sangin a year later. We walkthrough places now that a year ago were considered Indian country and weren’t ventured into without a MCLIC and a reinforced company. The work that 3/5, 1/5, and 1/6 did after we left is very apparent. The area is significantly quieter than it was a year ago. Last year we woke up and went to sleep to the sounds of gunfire and explosions; now, all of that has changed. 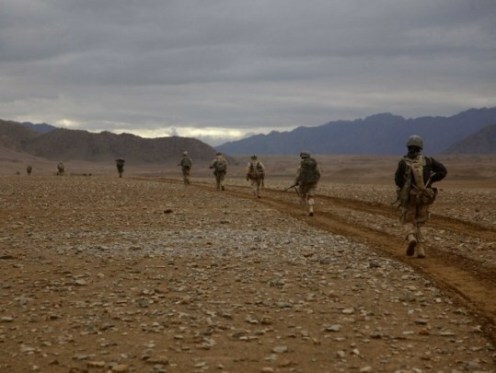 This isn’t to say that it’s not still one of the most dangerous places in Afghanistan, the IED threat is still akin to walking through minefield, and we have sustained casualties; however, the sacrifices made by 3/5 and 1/5 show. The atmospherics have improved, the fighting has lessened, and ANSF are beginning to take the reins. I was corpsman that was assigned to 3/5 way back. I feel the pain that these grunts went through, be it 1/5 or 3/5. Hearing the outstanding job that these battalion have done makes me proud that I had, for a short while, served along side them. Hurrah, & get some! wow i know this is very late to comment on this but it still really annoys me 3/7 marines wanting the spotlight. Its time to grow up. Sangin was not a game nor some place to get publicity. I dont care about record books and who dropped the most ordinance. I lost close friends in that horrible place not for a minute do I care who was there first you think the mothers and family members of those fallen care about who was there first. you should be ashamed of your ignorant comments. you think the families of 1/5 care that 3/5 was there before them all they know is they lost a loved one.